Gov. 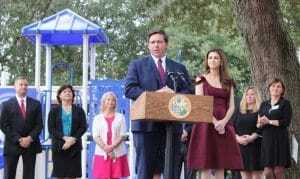 Ron DeSantis said Tuesday his proposed $91.3 billion budget allocates enough money to eliminate the waiting list for about 2,000 families statewide who’ve applied for the Gardiner Scholarship, which currently serves nearly 12,000 students with disabilities such as autism spectrum disorder, Down syndrome and cerebral palsy. 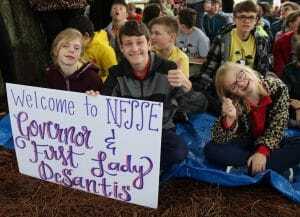 The scholarship allows parents a choice in educational opportunities for their special needs children, such as enrolling them in schools like nonprofit North Florida School of Education in Arlington where DeSantis announced he’s getting rid of the entire Gardiner waiting list. Tim Crass said without the scholarship his family might not have been able to send his 8-year-old son, Drew, who has Down syndrome, to North Florida School of Education. The scholarship — which pays for about two-thirds of Drew’s tuition — allows him to attend a school where he thrives, Crass said. “Without the Gardiner Scholarship, families who need schools like North Florida wouldn’t be able to get the education for their children,” Crass said. The North Florida School of Special Education serves 161 students ages 6 to 22 with mild to moderate intellectual disabilities, as well as 65 post-graduate students 22 or older. Offering a variety of academic, life skills and therapy programs, the school provides an individualized education plan that meets each student’s academic needs. No student is turned away from the school because of inability to pay. About 25 of its students received the Gardiner Scholarship in the 2018-19 school year, while 136 received the state’s McKay Scholarship, which also helps special needs students. “North Florida School of Special Education would not be where we are today without the McKay and Gardiner scholarships,” Hazelip said. The governor’s announcement is cause to celebrate “bold educational options that are not one size fits all,” she said….